On Saturday it was the sprints, where Connor narrowly snatched victory from Kai Lenny in a battle to the line after the two dominated the early rounds and then went toe-to-toe right throughout the final. Kai was leading by a board length coming into the final buoy, before Connor dug deep to find an extra gear, pulled alongside his rival in the final metres and then won the sprint through the shallow water to the finish line. Then on Sunday it was time for the six mile Distance Race. Kai had all the work to do; the only way he could claim the overall event title was to defeat Connor and force his rival into a tie-breaker sprint-off. But it wasn’t to be. Connor had a strong lead for most of the race and despite going off course at one point (and losing the lead) the Starboard superstar still crossed the line 30 seconds ahead of Kai. For the second day running, Zane and Jake had a battle to the line, with the Maui boy reversing the result from Day One to finish tied for third overall with the Aussie. The two then had a tie-breaker sprint-off for third, with Jake narrowly taking it out. Over in the women’s race Annabel Anderson was too strong again, finishing well clear and comfortably claiming the overall title. 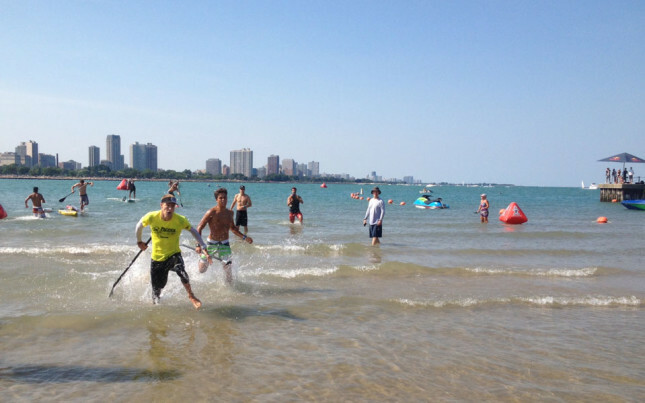 The 2013 Chicago World Paddle Challenge attracted a relatively small field of around 10 elite athletes, which meant much of the focus was on the continued rivalry between Naish superstar Kai Lenny and Starboard prodigy Connor Baxter. Despite a few of the world’s best paddlers starting alongside them, the two finished well clear in both the Sprints and Distance races, though again it was Connor who took the double victory. Kai went on to say that he wasn’t happy with anything other than a first place finish, and that he knew Connor was the same. So after Kai Lenny dominated the latter half of 2012, this year it’s been all Connor. Both of them have competed in five out of the six Stand Up World Series events in 2013: Connor is undefeated while Kai hasn’t lost to anybody other than his Maui rival. This gives Connor a big lead in the 2013 World Series rankings, though the season isn’t over yet… There are two more events: San Francisco is next week while Huntington Beach takes place just before the BoP. Then it’s off to Turtle Bay on Oahu mid-October for the World Series Finals.